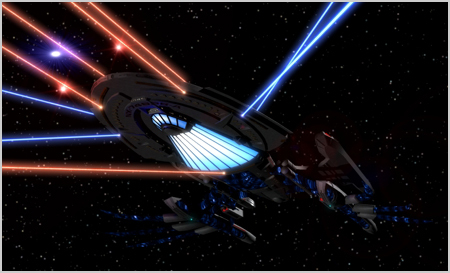 The Voyager Class is armed with multiple Type XII phaser arrays capable of firing at multiple targets simultaneously. 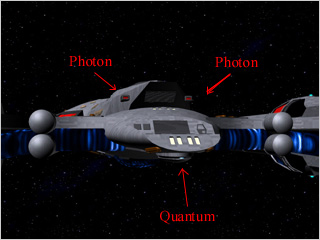 These Phaser arrays, located on the upper and lower saucer, between the saucer and main hull, and on the main hull, are the new and improved versions of the Type X phasers featured on the Galaxy and Intrepid classes. The Type XII phasers have a shorter recharge time and can fire a longer sustained burst, giving each bank a greater combat effectiveness than the type X array. However these new phasers, identical to these on the Sovereign Class, are of limited use against a Sernaix starship and require multiple banks firing simultaneously to destroy even a scout. The new phasers are housed within Starfleet's new Multifunctional Phased Arrays (MPA). The Voyager Class is also armed with Type-4 Burst Fire torpedo launchers. The launchers are located below and to either side of the saucer section (2), in the front of the battle section (2), and at the aft of the battle section (2). Two of the forward launchers are located beneath the saucer section and only come on line when the saucer has separated. The type-4 launchers are the most powerful currently in service with the Federation. They can fire a burst of 12 torpedoes every 5 seconds - or alternately can fire single rounds at a high rate of fire. The only other Federation vessel equipped with the Type-4 Burst Fire Tubes is the Sovereign Class. The Voyager Class is armed with 2 heavy turret quantum torpedo launchers. The primary launcher is located at the bottom of the saucer section, just above the Captain's Yacht. The secondary launcher is located just below the primary shuttle bay at the aft of the battle section. The torpedoes are loaded into an internal rotating rack, making the launchers capable of firinf 5 quantum torpedoes per second, and up to 15 before requiring cool-down. The launchers themselves are on rotating turrets capable of firing torpedoes in an arc of 180*. Combined, the launchers can fire quantum torpedoes 360* around the ship. The Tri-Cobalt warhead is a high-yield subspace device used for large scale destruction of stationary tergets such as space stations. Although the Federation is banned from using subspace weapons by the Kittomer Accords, Starfleet vessels do carry tri-cobalt devices occasionally, The U.S.S. Voyager (Reg. NCC-74656) used two of them to destroy the Caretaker's array in order to prevent it from falling into the hands of the Kazon. The Starfleet weapon has a programmable yield which can reach 20 000 Terracochranes, more than enough to destroy even a large station like the Caretaker's array. The Voyager Class carries 6 Sernaix CB-XI pulse cannons on the tips of the slipstream engine spike. These cannons only activate when the ship engines are online and in the deployed position. 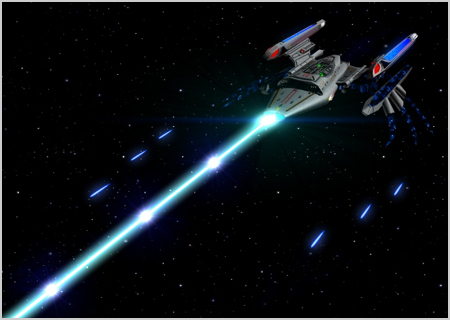 The Voyager Class has an adapted version of the Type-II Sernaix Beam Weapon installed into its MPA's. However, the output of this weapon requires it to be fired at a very slow rate; otherwise the MPA's will overload and meltdown, effectively destroying all systems requireing them. The Voyager Class is equipped with a slightly more advanced form of the Sernaix Kep'Tak'nel, thanks to the assistance of Ozymandias, Seven of Nine and the Intrepid Class Voyager's aquired data. It is fired from an emitter just above the main deflector on the secondary hull. 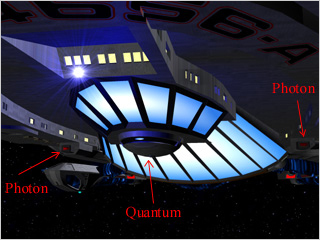 When the ship is not seperated, the saucer's main deflector acts as a conduit for the weapon, allowing power from the saucer's warp core to be channeled into the weapon, boosting its power.